Robots are becoming increasingly used to replace human activity in many areas of modern society. They've been used for decades in various forms of manufacturing such as car assembly, in medicine and and are even used now in the dairy industry in New Zealand and other parts of the world. Tasks that were once considered too sophisticated and something that humans only could do are now being taken up by the use of robots. Education has long been considered sacred in this regard, with the catch cry "robots will never replace teachers" oft repeated. But consider how the repetitive and routine aspects of a teacher's job are already being replicated in the online world with software that provides adaptive learning experiences for learners, with increasing use of artificial intelligence behind it. In recent years, robots have crept onto the education scene, popping up in American classrooms as toy-like teaching assistants and in Japan as remote-controlled novelties. And now a school in Columbus Ohio has introduced a new robo-teacher into its classrooms to allow staff in other parts of the country to teach their pupils. The 1.2 metre tall robot features a screen that broadcasts a video of the teacher's face and a camera allows the teacher to see what is going on in the classroom. In some ways this is not robots replacing teachers in the conventional sense, rather, robots enhancing the teacher presence by allowing a teacher in one location to be present with learners in another. While the idea if a 'robot teacher' in a classroom conjures up images from sci-fi novels, the concept here is really only a step further from the traditional video conferencing approaches that have been used in education for more than a decade. Rather than crowding into a space to interact with the remote teacher on a screen, the remote teacher can now have a 'presence' in the physical classroom, with tools that allow her or him to act more like the traditional teacher might in the physical space. Of course, this is where the intrique reduces for me – as the fundamental premise of the robot as presented in this scenario is simply about replacing the physical teacher – not about changing or adpating the pedagogy in any way. 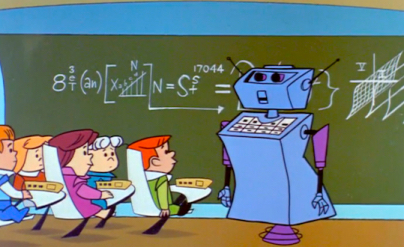 So the robot takes on the role of the traditional instructor, with the one to many pedagogy of the traditional classroom – rather like the images from the jetsons some decades ago! while I can see some potential for this sort of thinking in cases where the persistent presence of a teacher may be required, say with learners with special needs, the concept of am instructionally oriented teacher being replaced by a robot like this doesn't exactly excite me – it's rather like replacing the traditional paper based exam with an online equivalent and calling it an advance in assessment. The arguments for and against the use of technology like this in education has long provoked reaction from a wide range of perspectives, as a recent article by Stephen Heppell in the Sydney Morning Herald illustrates (read in particular the responses at the bottom). We need to beware of the seduction of technology, yet critically aware of the ways in which it is incrementally permeating our lives, creating new opportunities, and new challenges. Education won't be immune. What makes a learning environment modern? The term modern learning environments (MLE) has gained currency in recent years as a way of referring to the new forms of school buildings that are being constructed in New Zealand and other places around the world. The term is synonomous with 21st Century Learning Envrionments, or Schools of the Future etc. As with any form of language there are those who support as well as those who oppose the use of the term or phrase. For me, reference to 21st Century Learning Environments had meaning at the end of last century, but is a term that loses currency every year we actually enter into the 21st century, and "schools for the future" draws you into the endless discussions about what the future might be, and whether we should be preparing our students for the future, or be considering what education might be like in the future. Both are valid questions, but difficult to ascribe meaning to in terms of school buildings. 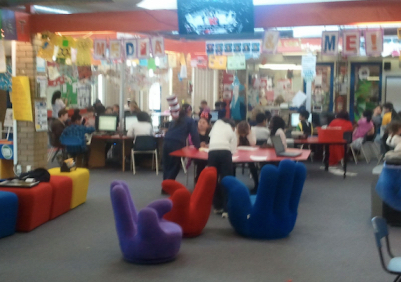 Personally, I like the term 'modern learning environments'. I like it for two reasons, firstly because of the reference to learning environments rather than schools. This opens up the possibility for considering all sorts of dimensions to what a learning environment might be – from what we currently know and understand as schools with organised classrooms etc, to community learning spaces, homes and evern the virtual (online) dimension that now forms a significant part of most students' learning experience. Second, I like the use of the term 'modern'. I know that many people argue against the use of this term, based on the fact that buildings constructed back at the turn of last century may have been considered modern then, but are 'old hat' and no longer fit for purpose nowadays. Others argue that many of the buildings being constructed now aren't modern, but merely replicas of what we've had in the past. For me, however, it's the genesis of the term 'modern' that gives it meaning for me in the context of modern learning environments. Understood like this, to be modern, any thing we're designing or building must be conceived of and developed for what we know and understand 'just now', drawing on our lessons from the past, and considering the demands of the future (whatever they may be) – but in essence, it must capture the essence of "just now" – which, in my view, necessarily means it cannot be then cast in stone and considered "finished", but must be continually refreshed and revisited in order that the design remain current and "just now" as the future unfolds. The principles of "open-ness", "flexibility" and "agility" that underpin so much of what is in the literature about modern learning environments underpins the significance of this for me. While architects may plan and builders construct the sorts of buildings we will then occupy to teach and learn in, it is this very activity that will define them as learning environments, and as such, they need to be able to accommodate our need for change in practice as a result of changes in our mental models and the beliefs we hold and share about teaching and learning. Basically, I believe that to be 'modern' means, as its definition suggests, continually "just now", or "contemporary", and as such, means that we must always be in a state of openness to change and development. This is why it's really not possible to copy what someone else has done, or to template the design of a MLE (building) and replicate it in a number of contexts (despite the economic benefits of doing so). While we can certainly draw inspiration from what others have done, a truly modern learning environment will be "just now" for the community that will occupy and use it, reflecting their particular values and beliefs, and be flexible enough to accommodate these as they change and adapt into the future. True – we've had buildings constructed for schools in the past that were considered modern at the time – and are now considered 'out of date'. The reason – they lacked the ability to be used flexibly and creatively as the needs and aspirations of those using them changed and evolved. A MLE isn't about the amount of glass and concrete that is used, or about the lines, shapes and angles that are incorporated – it isn't even about the amount of technology that is crammed into every crevice of the structure – it's about the people who use it, and about how flexible, agile and adaptable it is to how it will be used, now and in the future. 'is it a place learners where can feel safe? 'does it support learners with different learning needs and styles? Lots to ponder here – I'd be interested in what others think? I came across this RSA style video titled Why Education Needs to Change: A Student Perspective on Vimeo today. It was made by grade 8 students at the Calgary Science School as part of a “Renaissance for our Times” project, and was made in response to Ken Robison’s TED talk about shifting educational paradigms. It’s worth a view, as it provides a refreshingly ‘raw’ interpretation of the issues, with some challenging comments. “School is a place where students learn largely by working on projects that come from their own interests — their own visions of a place where they want to be, a thing they want to make or a subject they want to explore. The contribution of technology is that it makes possible projects that are both very difficult and very engaging. 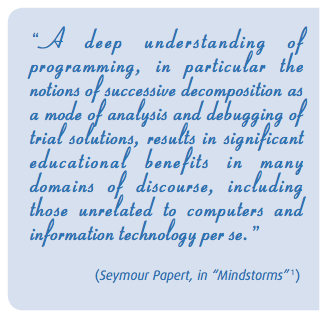 Papert, S. & Caperton, G. (1999). Vision for Education: The Caperton-Papert Platform. Essay written for the 91st annual National Governors’ Association meeting held in St. Louis, Missouri in August of 1999. All of this is churning around in my mind at a time when we are facing some serious challenges to the provision of schooling in Christchurch post earthquake, with many schools damaged severely, and others limited in what they can provide. I’ve been working with the GCSN locally, and with the MoE nationally to develop solutions to this problem. So why is it that, when the opportunity for some serious change presents itself, we neglect to listen to what our learners have to say, or to the education philosophers who have so elequently described what the ‘desired’ state of school might be like? What concerns me is that, at this time of stress, we again return to the things we’re most familiar with – focusing on the square box classrooms, regimes of timetables and subject specialisation etc. Blended learning is the ‘buzz’ word around the world at the moment it would seem. It appears regularly through recent Ministry of Education documents on eLearning and effective teaching, and is a centre-piece of the latest round of eLearning professional development contracts. We’ve certainly seen a rise in blended learning approaches in some NZ schools in recent years, particularly within the Virtual Learning Network, and now within some of the UFB schools, such as the GCSN in Christchurch. A report just out from the US brings a timely perspective to this phenomenon, focusing specifically on the schooling sector. Titled, The Rise of K-12 Blended Learning, the report concludes that, in the US, what was originally a distance- learning phenomenon no longer is. Most of the growth is occurring in blended-learning environments, in which students learn online in an adult-supervised environment at least part of the time. The report is co-authored by Michael, Horn, who, along with Clay Christiansen and Curtis Johnson, wrote Disrupting Class, in which they address the dilemma of why, despite massive investment in technology over the past two decades, schools have failed to see the significant changes that have occurred in so many other areas. Their conclusion, schools have simply ‘crammed’ the technology into existing structures – they haven’t allowed it to disrupt the traditional ways of doing things. The growth of online learning in brick-and-mortar schools carries with it a bigger opportunity that has not existed in the past with education technology, which has been treated as an add-on to the current education system and conventional classroom structure. Online learning has the potential to be a disruptive force that will transform the factory-like, monolithic structure that has dominated America’s schools into a new model that is student-centric, highly personalized for each learner, and more productive, as it delivers dramatically better results at the same or lower cost. Policymakers and education leaders must adopt the right policies for this to happen. There is a significant risk that the existing education system will co-opt online learning as it blends it into its current flawed model—and, just as is the case now, too few students will receive an excellent education. The point is, if we’re to successfully embrace the potentially huge opportunities that a blended learning approach can offer, we have to be prepared to disrupt our existing structures, mindsets and ‘comfort zones’. That will take leadership (see my previous post) – not just management. Teachers in traditional schools can use an online component- as I do- to replace uninspired worksheet style homework assignments. Instead of requiring my high school English students to complete analysis questions or reading comprehension questions that take hours to grade, I now use my structured online discussion forum- Collaborize Classroom- to engage students in dynamic student let discussions. I have tried blogs and wikis with students to little success, but my Collaborize site actually lets me post different types of questions- multiple choice, yes/no, vote and suggest and forum- to structure discussion and add variety to conversations. 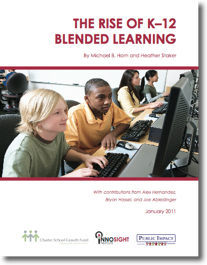 The blended learning phenomena looks like it’s here to stay – and I say “bring it on”. BUT, let’s also take note of the insights provided in this report (and others) that point to the need for shifts in policy and pedagogical practice. 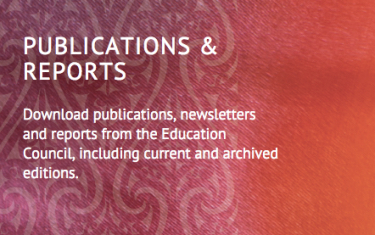 For more commentary on the report read this eClassroom News article.